Did you know there are more than 200 types of cancer. However, only a few of them are somewhat known to people? Breast cancer, cancer cervix, oral cancer, lung cancer, prostate cancer, colon cancer are among the most common cancer types. 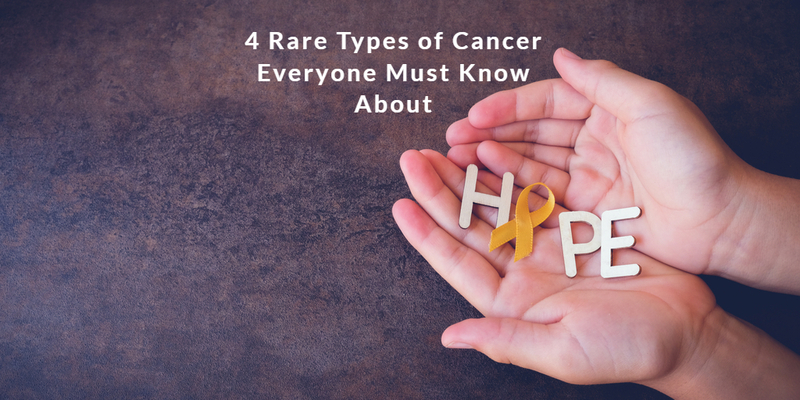 It is important that we know about the uncommon cancer types, just to stay alert and informed. Experts have quoted that if fewer than 2 in 100,000 people are diagnosed every year with a particular cancer type, it is considered as rare. Cancer affecting the thyroid gland is an uncommon occurrence. The causes of this cancer are not well understood but exposure to radiation is one factor that has been identified. It occurred commonly after bombing in Hiroshima and Nagasaki and after Chernobyl disaster. There are different types of cancer: papillary and follicular that are very slow growing, medullary cancer that is slightly more aggressive and anaplastic cancer that is very aggressive. Papillary and follicular cancers are the commonest thyroid cancers. Another rare cancer type, vaginal cancer affects only 1% of women. It is common after menopause or above the age of 60. The two main types of vaginal cancer are – Squamous cell carcinoma and Adenocarcinoma. The good news is that this cancer can be easily removed through surgery. Radiation therapy is also effective and useful. If anyone experiences any of these symptoms for more than two weeks, the advice is to consult a cancer specialist at the best cancer hospital in India. Salivary glands include parotid glands, submandibular glands and small glands in the mouth and throat. 1 in 100,000 people get affected by salivary gland cancer. Salivary gland cancer needs surgery with or without radiation for treatment. Interestingly, there is no direct relationship between tobacco, alcohol use and salivary gland cancer, unlike other cancer types affecting head and neck area. Chordoma is another rare cancer type that affects the spine. From the tailbone to the base of the skull, it can occur anywhere along the spine. This type of cancer typically affects adults aged between 40 and 70. Because the growth of the tumour is near the spinal cord and other critical areas, it is difficult to treat Chordoma. Cancer is one of the leading causes of death across the world. Its incidence in India is also increasing continuously. Every year lakhs of people lose their lives to cancer. However, the advancements in medical science have made it possible to treat even the most critical cases. Some of the best hospitals in India like Max Healthcare have also proved their mettle in successfully treating cancer patients over the years.